ABOUT wall paintings in ancient Punjab, we have no evidence that has survived. Percy Brown spoke of the possibility of some kind of mural decoration on the edifices of the Indus Valley civilisation. "More carefully conducted excavations in future," Charles Fabri felt, "may well reveal such mural decorations." Despite wanton destruction carried on in Punjab by successive waves of invaders, the art of mural painting, it is conjectured, continued to languish in a broken tradition. The advent of the 19th century in Punjab brings us to the threshold of a new era of this pictorial art and numerous instances of its having prominently in vogue come to light. It became a popular mode of embellishment under the Sikhs, struggled for existence in the violent social changes that came in the train of the British and succumbed to the great transformation that was brought about in Punjab by the turn of the century. Representation of the Sikh gurus constitute a major part of the themes pertaining to the Sikhs. More than half the murals portray Guru Nanak and Guru Gobind Singh, the first and the last of the Sikh gurus. From among the extant remains of the murals in Punjab, the earliest rendering of Guru Nanak is from the late 18th century painted panel in the temple of Shri Namdev at Ghoman in Gurdaspur. Guru Nanak often appears accompanied by Bhai Bala and Bhai Mardana, the former a chauri-bearer and the latter a rebab or rebeck player. Under a tree on which birds — mostly parrots — are shown perching, Guru Nanak usually sits cross-legged in characteristic meditative pose; his back supported by a round bolster, a rosary in his right hand, the left hand resting on his knee or the mat on the floor. His head is encircled in dark colour putting the face in relief. The outer ring of this circle takes the shape of a nimbus radiating golden rays, which symbolise the spirituality of the guru. There are a series of murals illustrating the life of Guru Nanak based on tradition as well as on large corpus of literature called the Janmasakhis. The most representative series are to be seen in the gurdwara of Baba Atal at Amritsar. 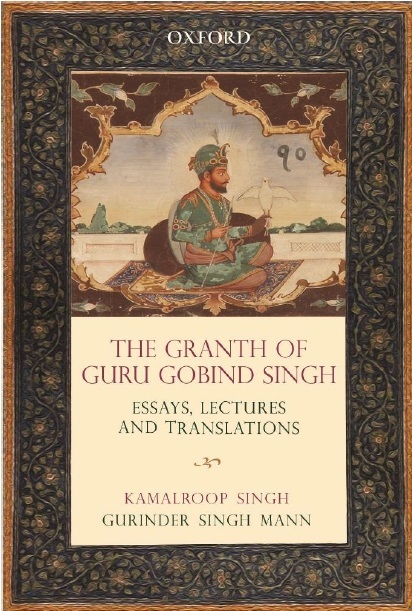 Beginning with the birth of Guru Nanak, the first part of the series illustrates themes from the Guru’s childhood consisting of scenes of the Guru attending school, disagreeing with his teacher’s lessons on worldly knowledge, grazing his father’s buffaloes and cows, feeding the poor and the holy etc. As he grows up, he is seen as a keeper of government stores at Sultanpur Lodhi, getting betrothed and married, and renouncing the world. Then, he appears as a preacher meeting Malik Bhago and demonstrating the difference between the earnings of the oppressor and those of an honest man. Further, he is seen with cannibal Kauda, with Kaliyuga and Wali Kandhari, all of whom are made by him to relinquish their vileness. The series in Gurdwara Baba Atal end with the Guru appointing Angad Dev as his successor. Similar series are to be seen painted in the precincts of Gurdwara Ram Rai at Dehradun and at Gurdwara Baba Kala Dhari at Una, the latter have mostly faded with the passage of time. The old building of Gurdwara Panja Sahib at Hasan Abdal, too, once had murals relating to the Guru’s life. Another important theme in the murals is the sidha goshti, Guru Nanak’s religious discourse with the sidhas, usually representing the Guru facing the leader of the sidhas backed by a number of sidha ascetics sitting in their hierarchical order. Many a time, he appears along with his sons, Sri Chand and Lakhmi Chand, sitting respectfully before him. 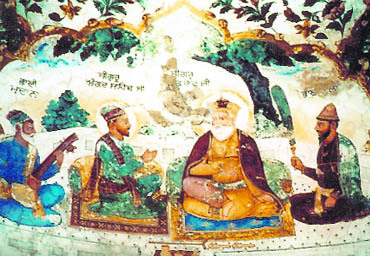 Murals representing Guru Nanak flanked by the rest of the Gurus were painted several times. Typical examples are to be seen in the samadh of Mahant Mangni Ram and akhara Bala Nand, both at Amritsar; in the shivala of Hardhan at Matewal, a village near Amritsar and in the samadh of Baba Mohar Singh at Tanda in Hoshiarpur. Among the paintings that embellished the walls of a palace at Wazirabad, now in Pakistan, built by Maharaja Ranjit Singh, were the life-size portraits of the Gurus from Guru Nanak to Guru Gobind, according to Baron Charles Hugel, who saw these there personally. Lieut William Barr, who visited Lahore in 1839, saw several murals in the royal palace, including the one that depicted Maharaja Ranjit Singh standing in reverence before the Guru. 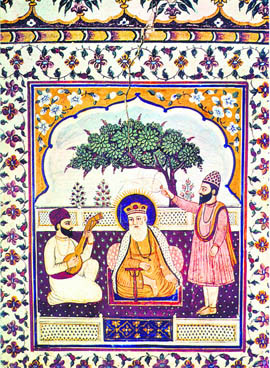 He wrote: "`85picture represents the Maharaja in the presence of Baba Nanak, the founder of the Sikh sect; the holy father being most splendidly robed in a suit of embroidered gold, and sitting; whilst his disciple, who had done so much to extend the domains of his followers, is dressed in bright green silk, and standing, with his hands joined in a supplicatory manner. Behind the Baba, keeping guard is an Akali, with drawn sword, and with but very little covering".